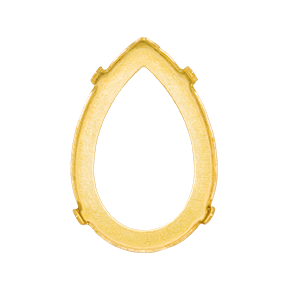 The 4320/S Swarovski Pear Fancy Stone Setting is made of brass and designed to work with the Swarovski 4320 Fancy Stone. These settings are designed for stringing or sewing on, with 2 holes (1 hole each side) and an open back. These 6x4mm Unplated 2 Hole Swarovski Pear Fancy Stone Settings 4320/S are available here in a full factory package of 360 pieces.